The High Voltage BYD B-Box H 7.7 Battery Storage with SMA Storage 3.7 Pack is one of the most sold items in our shop. The BYD B-BOX HV comes in sections to allow you to build your battery to your required power, each section comes in 1.28 kW stacks which start at 6.4 kW and go up to 11.52 kW of usable power. This expandable system allows a lower cost of entry into self consumption/energy storage from your solar system allowing you to build over time. The system is compatible with SMA Energy Storage Inverters. 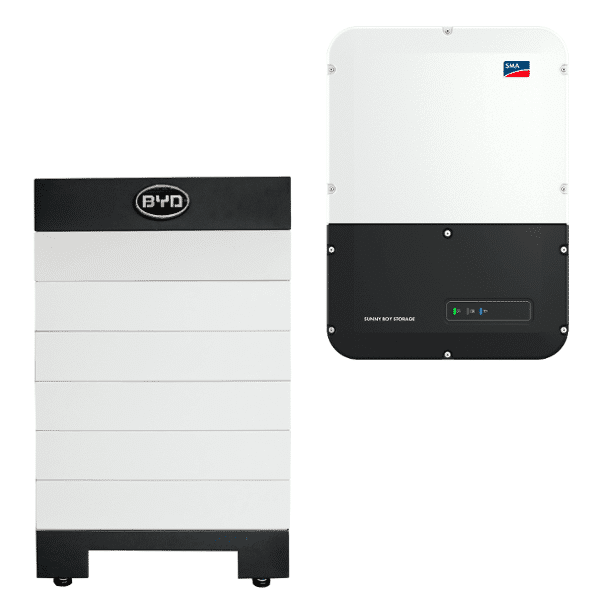 This version High Voltage BYD B-Box H 7.7 Battery Storage with SMA Storage 3.7 Pack would come with 6 x 1.28 kW Lithium Battery Stacks and the BMU which forms the base and top section of the package.